Software projects, partial and complete. Often dusty. Autologout.scr - Logout user after a period of idle time with a warning. A very simple screen saver that will present a large notification box for a specified period of time before logging the user off. Console and PHP/Joomla scripts to dump out entries from Tom Merritt's chronology of tech history. Emposk - A touchscreen on screen keyboard for windows. 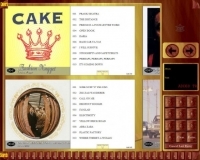 Empathy Jukebox - a touchscreen ready virtual CD jukebox.